My start to dropping down came about in 2011 while in spring training with the Orioles. I went to big league camp after having a great winter in Mexico. I was worn out in winter ball and my stuff wasn't where it needed to be. I had a very close relationship with the big league pitching coach Marc Connor and manager Buck Showalter as they were the ones who drafted me while in Arizona. They suggested I needed to come up with something if I wanted to continue on with my career. So I made the decision to try it. I was very lucky when I decided to do this because I had an organization that was willing to let me work on it and I had Mark Worrell as my catch partner to give me advice. Mark was very helpful with all kinds of issues ranging from arm angle to what the ball was doing when he was catching it. As you know side armers really have no one to talk to about things except other side armers when it comes to mechanics and approach. I really listened to Mark and his advice since he had some really impressive numbers and accomplishments up to that point in his career. I still threw pretty hard for dropping down but not hard enough to rely on velocity alone. So for the first time in my career I wasn't trying to strike anyone out. I was pitching to contact and it showed in my results. I started averaging 8-10 pitches per inning which was very fun for me. A lot less work and stress. I would say no I do not believe I would have had the same success if I stayed over the top. It was the right time for me in my career to do it. It depends on what level they are at, age and how natural it feels to them. I think it makes sense for someone that was in my position more than a high school kid. The biggest thing is does it feel natural. For me I had the same mechanical issues as over the top. I rushed my delivery which caused me to fly open. For me a big key was to make sure my right leg started going down while over the rubber. 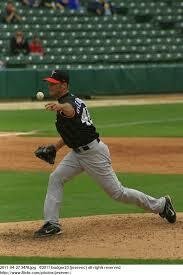 This seemed to really get me locked in and allowed me to finish out front which is key to any pitcher. I threw a 2 and 4 seamer, split and an inconsistent slider. My split was pretty good on righties and I wish I would have used it more on lefties. The inconsistency of the slider is why I could not get a job in 2012. Righties I just kept fastballs and split down and away and would bust in when I could see a guy starting to dive. Lefties it depended on the batter. I would usually go away and then bust in. If I had a slider that day they had no chance after I pounded them in. I loved the sinking action I got on the ball, the deception and the fact that it was just easier for me to keep the ball down at the knees. A hitter does not want to get up there and see something different. If a side armer can remember that he has an advantage before the hitter comes to bat. Now just focus on making your pitch and watch the groundballs pile up.